Eyebrows- Protects the eyes from sweat, dust, raindrops etc. 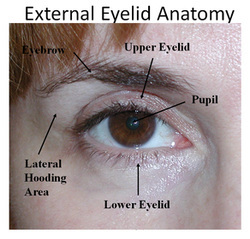 Eyelids- There are upper and lower eyelids with eyelashes. The eyelids blink at regular intervals to protect the eyes from injury, dust, germs and other foreign matter. Melbomian glands- They open in the hair follicles of eye lashes and secrete an oily secretion that help in frictionless blinking. Lacrimal glands- Almond shaped glands at the upper and outer border of the eyes. Lacrimal glands: The lacrimal gland is an organ that produces a liquid that is the primary component of tears. 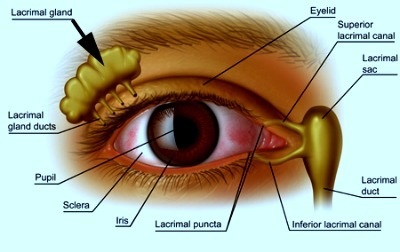 There is one in each eye and it is located above the eye and toward its outer portion. The secretion passes from eye into the nasal chamber through naso-lachrymal duct and the superior and inferior lachrymal canals. Human eyes are located in bony orbital sockets and cushioned in fatty connective tissue. The eyes are directed forward and adapted for binocular vision. There are six extrinsic muscles that help in the movement of the eyes. Cornea- It is a thin transparent part that is exposed. It forms remaining 1/6th of the fibrous coat. The demarcation between the cornea and the sclera is the sclero-corneal junction. Cornea is further covered by a thin transparent, vascular membrane called conjunctiva. This is continuous with the eyelids. Choroid- It lies next to the sclera and is made up of connective tissue with pigments and some smooth muscles. It also has blood vessels that nourish the retina. The pigements are dark brown in colour and prevent reflection of light. Iris- The choroid bends inside at the junction of sclera and cornea to form a thin coloured partition. This is the iris and may be brown, black or blue depending on the pigments in the choroid. There is a perforation in the middle of the iris forming an aperture called the pupil. The iris has two sets of muscles the circular muscles (sphincters) and the radial muscles (dilators). Ciliary body- The vascular coat at the ends of the iris is less vascular, less pigmented and thicker- this is ciliary body. It has radiating folds called ciliary processes. This also contains smooth muscles called the ciliary muscles. Optic part- It is the part that lies in contact with the choroid - it has a single layer of pigmented cells, a peripheral layer of photoreceptor cells, middle layer of bipolar neurons and inner layer of ganglionic cells that join to form the nerve. 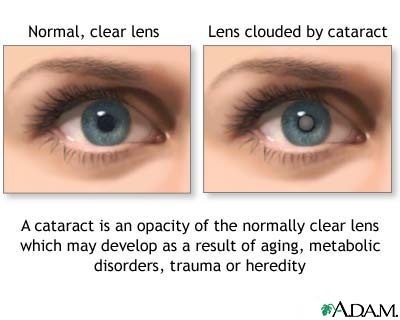 Ciliary part- It is a thin pigmented part that is in contact with the ciliary body. It secretes the aqueous humor. Iridial part- It lies in association with the ciliary body and is made up of a layer of pigmented cells. It gives colour to the eye. The ciliary body and the iris is formed partly form the choroid and partly from the retina. Rods are elongated and rod shaped. Rods are sensitive to dim light. Rods enable night or dark vision. Rods are present at the periphery of the retina. There are only one type of rod cell. Cones are pointed, cone shaped. Cones contain a violet pigment- Iodopsin. Cones are sensitive to bright light. Cones are associated with colour vision. Cones are more abundant in the rear wall and fovea of retina. There are three types of cone cells. The trichromatic theory of colour vision explains how humans are able to view different colours. According to this theory, there are three types of cone cells which are stimulated by different wavelengths of visible light. These are erythrolabs for red colour, cyanolabs for blue colour and chlorolabs for green colour. The macula lutea is the small, yellowish central portion of the retina. It is the area providing the clearest, most distinct vision. The center of the macula is called the fovea centralis, an area where all of the photoreceptors are cones; there are no rods in the fovea. The fovea is the point of sharpest, most acute visual acuity (visual acuity is an indication of the clarity or clearness of one’s vision). The optic nerve is a continuation of the axons of the ganglion cells in the retina. 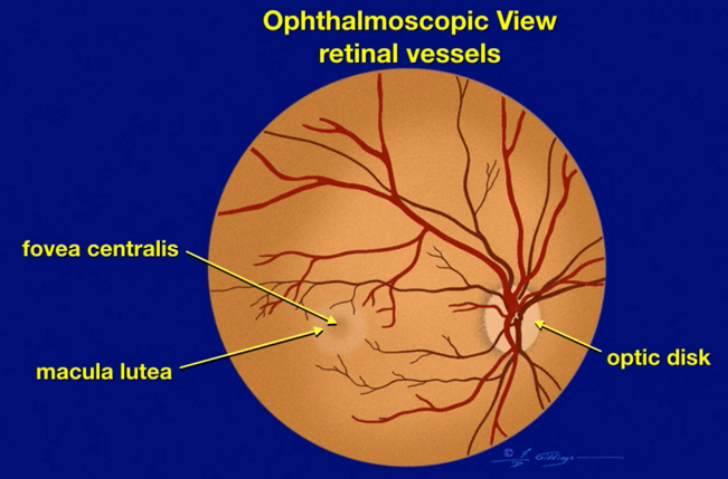 The beginning of the optic nerve in the retina is called the optic nerve head or optic disc. Since there are no photoreceptors in the optic nerve head, this area of the retina cannot respond to light stimulation. As a result, it is known as the “blind spot,” and everybody has one in each eye. The lens is solid, circular, transparent and biconvex structure that lies behind the iris. 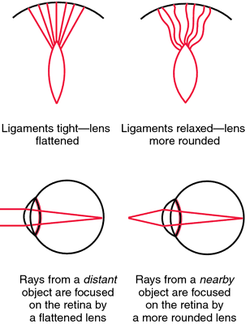 The lens is an organ that, remarkably, retains all its cells for the lifetime of the organism. It is enclosed in its collagen capsule and is bathed in fluids and so is completely avascular. The eye lens contain a single family of proteins called crystallins. The anterior small aqueous chamber- It lies in the front of the lens and and is filled with a clear watery fluid called aqueous humor. It provides nutrition to the lens and cornea, supports the lens, refracts the light rays to focus on retina and removes metabolic wastes from the neighboring cells. The posterior large viterous chamber- It is larger than the aqueous chamber and lies behind the lens. It is filled with a viscous jelly like substance called the viterous humor. It provides shape to the eye, supports retina and lens and refracts the light rays. 1. It occurs in aqueous chamber. 2. It is a watery fluid. 3. It is secreted by ciliary processes. 4. It is continuously absorbed into blood. 5. It contains most of the diffusible substances of the plasma. 6. Obstruction in its flow may damage retina by increasing intraocular presure. 1. It occurs in vitreous chamber. 2. It is a jelly-like substance. 3. It is secreted by retina during development of eye. 4. It is not absorbed. 5. It consists of water (90%), protein vitrein, hyaluronic acid and collagen fibers. 6. It does not flow. The iris has two sets of muscles the circular muscles (sphincters) and the radial muscles (dilators). When there is bright light the circular muscles contract the pupil constricts or narrow and let less amount of light enter the eye. 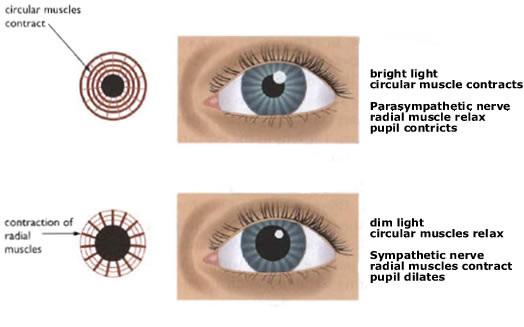 When in dim light the circular muscles relax such that the pupil dilates to let in more light. It is the ability of the eye to adjust focal length of the lens to make clear image of the objects located at varying distances. This is achieved by the by changing the convexity of the lens. The ciliary body and the suspensory ligaments work together and form the accomodation apparatus. ciliary muscle relax, suspensory ligament tighten. ciliary muscle contract, suspensory ligament relaxes. Human eye is sensitive to light wave lengths varying form 360 to 760 nanometres. The eye has two functional parts : dioptric or focusing part and receptor part. 1. Focusing Part : Cornea, conjuctiva, lens, aqueous humour and vitreous humour all together act as small lenses and reflect the light rays to focus on the photoreceptors of retina. 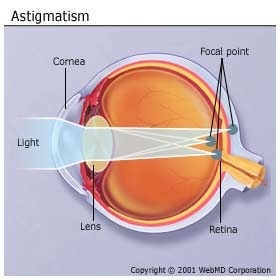 So, these collectively form the focusing part of eye. 2. Receptor Part : It comprises the retina. 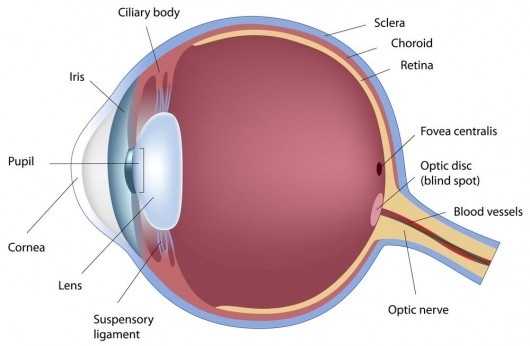 The image formed by the retina is inverted and smaller than the object. It converts the energy of specific wavelengths into sensory impulses of nerve fibres. 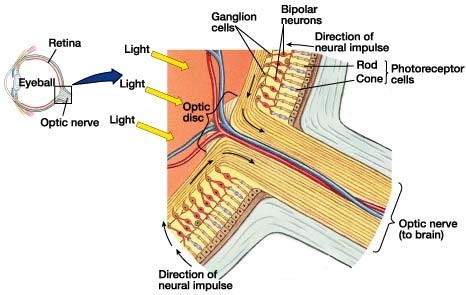 These impulses are carried by the optic nerve to the visual areas of cerebral hemispheres were these are analysed and coordinated so that animal becomes aware of the normal erect pattern of the object. Light reflected from an object enters the through the pupil. Iris controls the amount of light passing through by controlling the size of the pupil. The rays of light converge as they pass through the aqueous humor, lens and viterous humor and finally focus on the retina. the image formed on the retina is an inverted image of the object. The inverted image is picked up by the optic nerve which takes it to the brain (occipital lobe). An upright image of this then perceived by the individual.